Greetings! 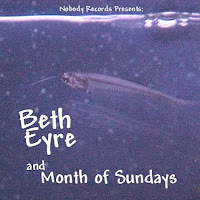 I'm back with another music post (after the two "trip" blog entries) and today I'm going to write about Beth Eyre and Month of Sundays. Beth is my sister and she has a beautiful gift - both singing and songwriting. For years she lived in L.A. working primarily in cover bands around Orange County (although they did gig around the Southland). She managed to make a very nice living doing it and she was excellent at it. I recall as a teenager (as I was playing in bands) thinking that it was a shame she was singing other people's music and that true artists only work on their own music. How wrong I was. Playing (or singing) other people's music gives you the opportunity to craft your own skills - your own sound - and in the end makes for a better artist. During her time in L.A. she was working with a guitarist named Vinnie and recorded a large number of tracks (five that can be heard on this CD). We selected our favorites of these sessions to put onto this CD. After living in Southern California for well over a decade Beth decided to move back to NorCal and soon after she did we started playing music together. Three of the tracks on this CD we wrote together - Beth wrote the lyrics and I wrote the music. The first song we wrote together was "All This Time'. "One Man" and "Let It Go By" followed and we recorded a three song demo to shop our wares and to get gigs with. We wrote many other songs, but they were never recorded. Working with my sister was great and our band was INCREDIBLE. We had studio caliber jazz musicians backing us up and our gigs were nothing short of amazing. One of them (pictured with Beth and I) was Frank Buchanan whose Mother was in a singing group (The Diamond 'Lils) with our Mother - a sort of Andrew's Sisters act. We had (sort of) grown up together watching our Mothers so it was funny that all those years later we were playing music together. Frank brought our songs to a new level as he is an amazing guitar player and songwriter. This act was definitely the best I have ever been in. We opened for a number of national acts. We were becoming a sort of "Brand New Heavies" type of act. One day I received a cease and desist from a band out of Boston (I think it was Boston - can't find a trace of them now) so we just adjusted our name and added Beth's name. Eventually it became too difficult to corral the drummer and bass player as they had better paying gigs (Beth and I would give 100% of our pay from gigs to the backing band - they deserved it!) and we disbanded. The dream of the sister/brother duo died. Beth can be heard on some Rain Station tracks as well as some of my solo work. I imagine at some point I'll ask her to come back into the studio with me and lay down more vocal tracks. Pay special attention to the tracks we recorded together...and I hope you enjoy them.